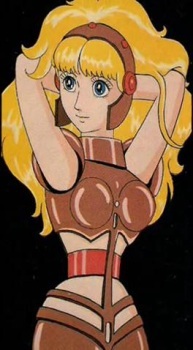 Not exactly a recurring character, she however has a prototype: a transforming lady robot called Jet, a supporting character in a minor work Whirlwind Z (Tezuka Osamu manga zenshu:, vol.52. Sempu: Z. Tokyo, "Kodansha", 1978). In 1979 a film critic K.Ono interviewing Tezuka mentioned Jet and said that a transforming robot would make for some interesting animation. According to the film's pamphlet, this was how the idea of Olga was conceived. Olga also makes a cameo appearance in one of Tezuka's later comics, Rainbow Parakeet (Tezuka Osamu manga zenshu:, vol.2 Nanairo Inko. Tokyo, "Kodansha", 1994). Since the title character of the series is, apart from being a thief, an actor, there are many theatre references, and the chapter in which Olga appears is named, uncoincidentally, Waiting for Godot after the surrealistic play by Samuel Beckett. As in the play, Godot (or, in this case, Godo?) himself does not appear. As in the film, Olga is a robot. Everything else is quite different from either film or play, with Olga being abused, broken, stolen and finally drowning in the sea "to wait for Godot for ever". Here is a page from the comic featuring Olga and Parakeet. Many thanks to Yokohama-Kabitan for pointing out the cameo and to OlgaMaster for providing the picture. Another unexpected cameo was spotted in Otaku-no Video, Gainax's classic satire of anime fans. One scene briefly features a Japanese girl dressed up as Olga standing in the crowd. Many thanks to OlgaMaster for the screenshot - a unique chance to see "Olga" with black hair.